Provide a common language to communicate about coastal hazards. The coolest part? There’s an app for it! Illegal fishing harms ocean ecosystems and coastal economies dependent on fishing, exacerbating the effects of climate change on these communities. This tool harnesses the power of big data by comparing countries’ reported seafood imports and exports to identify potential flows of illegal fishing trades. It is designed for use in over 170 countries, by fisheries, government officials, non-governmental organizations, and anyone else working to prevent illegal fishing. Want to know which countries’ Nationally Determined Contributions (NDCs) are related to Sustainable Development Goal (SDG) #14, Life Below Water? 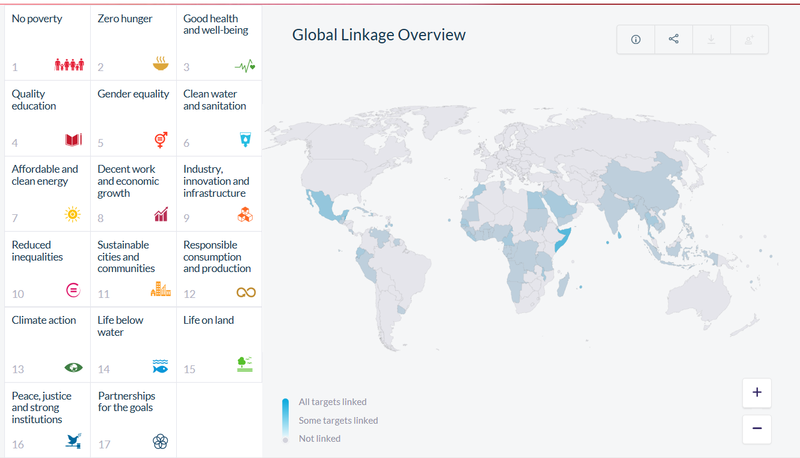 With the NDC-SDG linkage tool from the NDC Partnership, you can quickly see where working towards any particular SDG could simultaneously help a government reach its NDC implementation goals. It’s easy: quickly search the map of countries by SDG, or even a specific SDG target, click on a country, and the tool will bring you to the full text of the countries’ NDC, in which the phrase mentioning that NDC is highlighted. NDC implementation does not stand on its own, and looking for synergies between NDCs and SDGs is a great way to ensure that everyone working on a specific issue is aligned. This blog was written by Talia Calnek-Sugin, Knowledge and Learning Project Coordinator.